As a child I dreaded putting Christmas decor away. Not because of the work (I think my parents did all the work), but because I just didn't want it to be over! Our decor stayed around for several weeks after Christmas and my mom transitioned our one artificial tree in the dining room to a Valentine's Day tree with heart ornaments! As an adult, as much as I absolutely ADORE Christmas and Christmas decor, I also readily embrace January and fresh, clean, bright, new starts. The past two years, I've had Christmas packed up and put away before the New Year, but last year I was really determined to figure out some "January Decor." When it gets a bit closer to spring and Easter, I have decor that I love for the whole spring season. Summertime, I have a huge "flow" of mercury glass, sand, shells and all things beachy to pretend we live closer to the water! In the fall (technically from August-October) I decorate for the whole harvest season. However, for some reason with winter, we have Christmas decor and as soon as Christmas has come and gone (really at the start of the winter season), it all gets put away. I realized last year that I could pull things from my Christmas decor that were really more wintery and could work through Valentine's Day (after Valentine's Day, I transition to Spring/ Easter). It was a bit of picking and choosing--I do have a lot of Christmas decor after all. I felt like a lot of my silver trees and deer could work (and technically they could), but I kept standing back to take it all in and they were still reading Christmas to me. I wanted to put away the "crowded" feeling of Christmas, but still have decor that has the warm glow to keep you warm and cozy inside on blustery days and to add a little magic to the winter season! The best part is that you can probably shop post Christmas sales and pick up some great winter decor for 70% off this week! Here are a few pictures for inspiration. These are vignettes I did on my formal dining room table, buffet, living room and fireplace mantle. I'll add a few Valentine's Day elements in, in a few weeks. This one is a bit of an inspiration pic fail with the candles not lit, but wanted to include it since I know pinecones are an easy and practical addition to your January Decor! Have I ever mentioned how much I love decorating? Decorating is not a decision for me, it's something I HAVE to do. No matter what resources are available to me, I feel compelled to see them reach their full potential and make them as beautiful as I know how. In retrospect, I'm sure my parents have made the most profound impact on me in this area. They always had a lot of pride in our home-- they invested time, resources, blood, sweat and tears into making our family home the best that it could be. I remember spending summers out in the country as my parents tore down old buildings in exchange for keeping the materials they disassembled. My dad hand-cleaned every brick from their childhood school and used them to create an expansive back patio. Lumber from an old barn was re-purposed as framing for a 1.500 square foot addition to our home. Having a beautiful, wonderful place to live was top priority to my parents and I took it to heart. Many weekends of my childhood were spent at antique auctions and estate sales. I remember having an immense sense of pride when my dad bid (and won) a painting for me that was just for my tree house! My college dorm room was my first blank slate that was all my own. Even though most of the contents were purchased at WalMart or Dollar General, I did everything in my power to make it as warm and wonderful as I knew how. 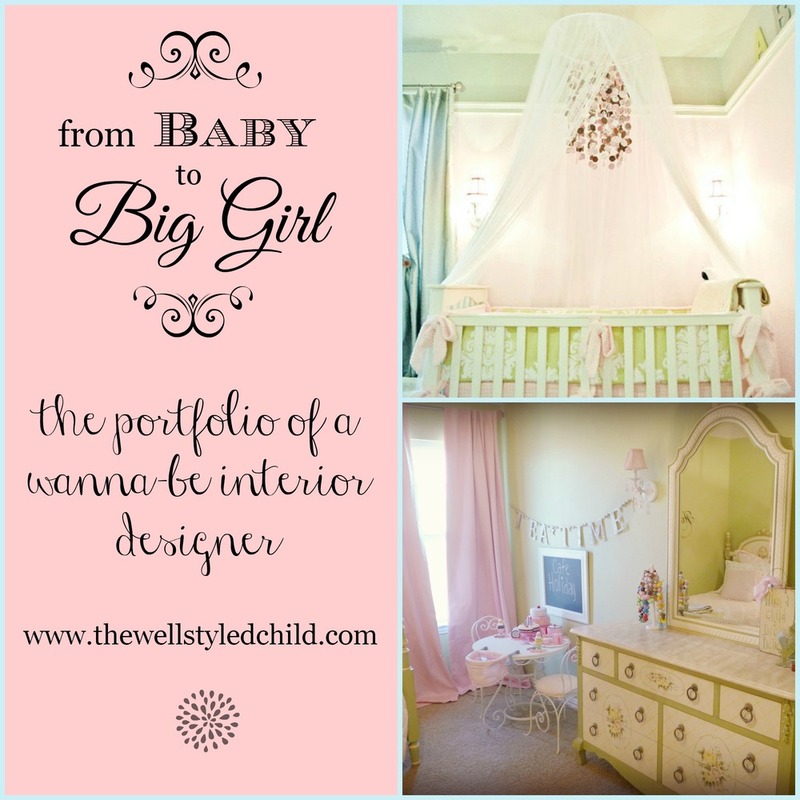 When I found out I was pregnant with my daughter Holiday, I started planning her nursery the very next day. As I began to envision what I wanted the space to look like, I was definitely going towards a strong vintage, shabby chic vibe. But the funny thing about decorating (at least for me) is that spaces rarely turn out the way I first imagined them. I start with a concept and then look for my jumping off point. 90% of the time (no matter what the project) I look to fabric as my initial inspiration and then start searching and incorporating items I love. I will be headed in a direction and then find an item I love that works well with the space, but might not be exactly in the same vein as my original concept. At that point, I allow my ideas and design to take a detour and morph into something a little different. I find that as I keep basing my design around things I love-- instead of forcing an initial concept-- I'm always thrilled with the end result. 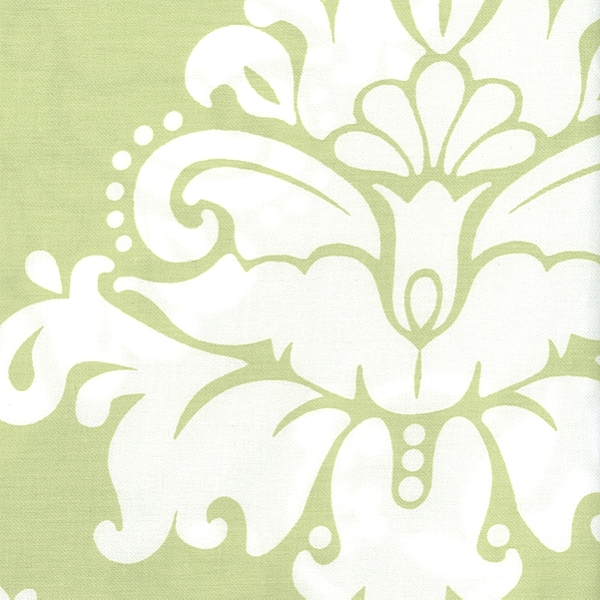 My first inspiration for the nursery was this Serena and Lily fabric. It's so incredibly soft and has the perfect amount of sheen to it. I fell in love with it and used it as my jumping off point to create the rest of the space. At $40/ yard, I couldn't use the fabric for a huge project, but I wanted to use it in a way that would have the greatest impact possible. I ended up doing just one side of the bumper in the Sprout Damask and then did pink chenille on the opposite side. 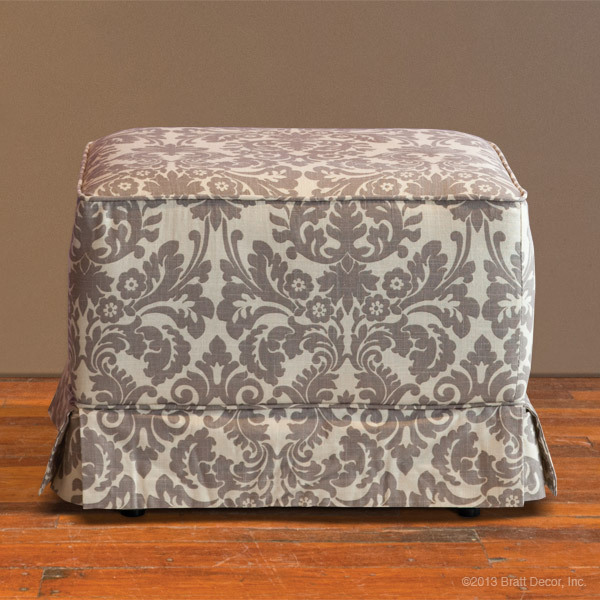 Again, to have the greatest impact, for the back bumper piece against the wall, I used the damask on the inside so it would be visible in the room. The little wrought iron table and chairs set, my parents found at a yard sale many, many years ago and my mom re-finished it for the nursery. I made the little chalkboard by simply painting a frame I had and then cutting some plywood to fit inside. I primed it and then covered it with a few coats of chalkboard paint and then sat it on this little shelf that I also painted and distressed to match the rest of the nursery. My heart still skips a beat every time I see this sweet, sweet picture of Holiday at 6 days old captured by my dear friend Becky Siegrist. It's just all the more special that she's laying on a table that has history, under a chalkboard I made for her first room! My plan for the nursery was to do bead board and chair rail until I remembered this nursery designed by my all-time favorite designer, Sarah Richardson. I really loved the trim piece 3/4 of the way up the wall with the alphabet going around the room. So the night before we were to start the bead board, I called off the project and took a slight detour towards this design. I think even though there are some antique and shabby chic elements in the room, this made it a bit fresher and more modern. I love how, in the inspiration room, they alternated the colors and sizes of the letters to give it some variation. I didn't want my letters to get too busy, but rather serve as an interesting layer. 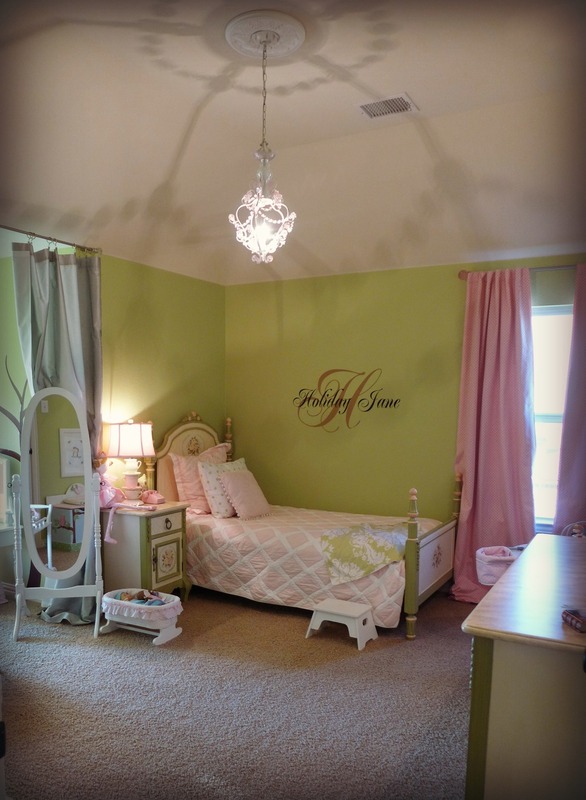 I painted them the light, serene colors of the nursery and used two different sizes to randomly alternate between. I searched a very long time to find lighting for the room. The sconces that flanked the crib I ended up purchasing from Amazon. The chandelier was a clearanced out floor model from a local lighting specialty store. One of the main things I did in the room was try to keep the colors as light, airy, serene and restful as possible. I feel like I actually have a lot going on in the room and many layers, but the light color palette makes it easy on the eyes. The main pink paint color is a VERY faint pink, the low light of the room actually makes it look a tad richer than it really is, but I quickly realized while testing paint colors that to get a soft pink on the wall, the swatch almost looked white. Behr Premium Plus "Be Mine 100A-2"
Behr Premium Plus "Light French Gray 720E-2"
I scored this $15 mirror from TJMaxx. It was well bolted to the wall as to not be a danger to the baby, but the space needed some height, so I incorporated the ribbon to make it look like the mirror was suspended from it. I also added an antique brooch to the center of the bow. My apothecary jar of rubber duckies was definitely among my favorite creative elements! We moved into our 2nd home right after Holiday's 2nd birthday. She was already completely potty trained and sleeping in a toddler bed, so I decided to transition her right into her "Big Girl" room! 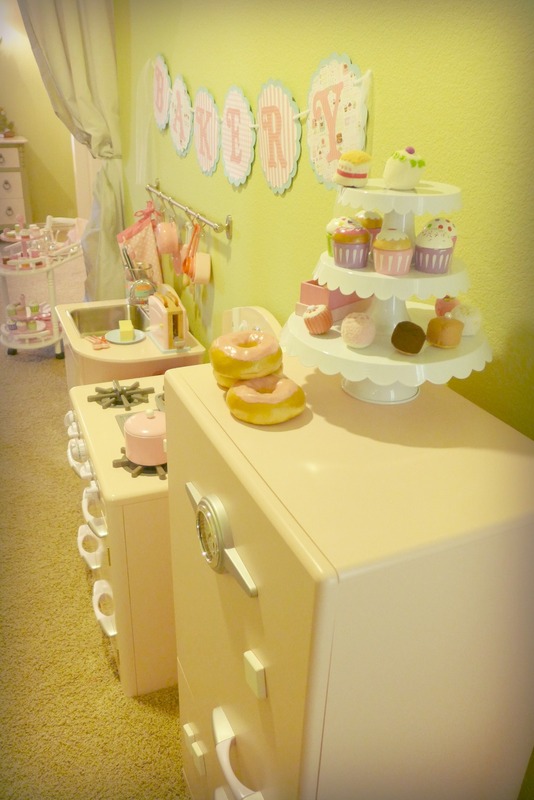 I incorporated a large majority of the pieces that I loved from her nursery into the new space. 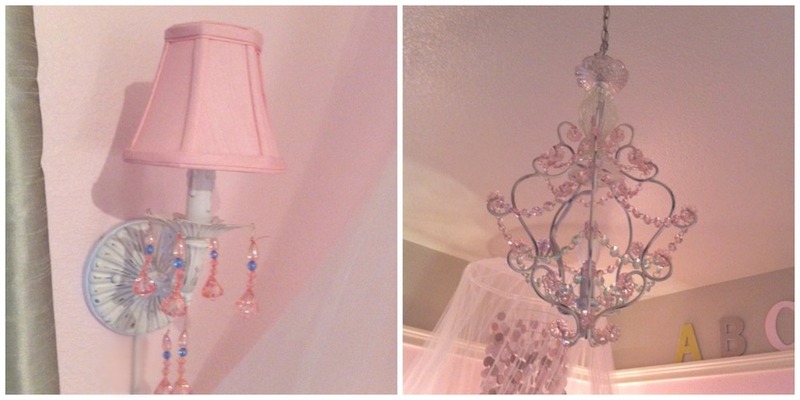 My sister asked me if I would like my niece's bedroom furniture as they updated from "Big Girl" to Tween. I had long-admired the hand painted furniture from my niece's room, but it posed a major creative challenge for me! For starters it wasn't the bright, fun Pottery Barn Kids-ish space that I was envisioning. Also, the pinks in the furniture had a peachy tinge to them and I wasn't finding bedding right off the bat that didn't clash. BUT I have learned through the years that some of my best work (in all areas creative) is birthed out a of a design challenge. 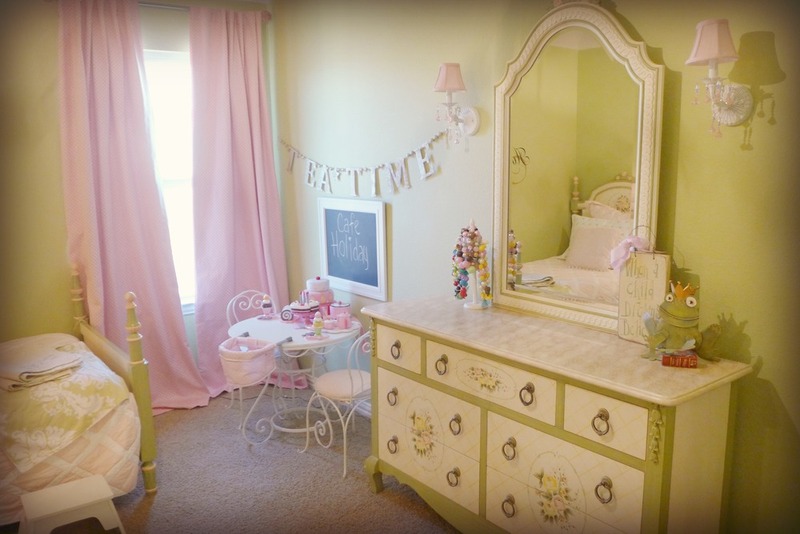 I decided to stick with the hand-painted furniture and I really do love how her Big Girl room has turned out. We have only been in our home for a year and all of the spaces are still "a work in progress," but Holiday's Big Girl room is mostly finished for the time being! I officially decided to keep the hand-painted furniture once I found this quilt from Serena and Lily. It was the perfect shade of pink with a hint of peach. I also loved that the harlequin pattern in the furniture is repeated on the quilt! I am still totally in love with this lamp that I stumbled across at HomeGoods. It couldn't be more perfect for the space and the silk shade is the identical peachy pink color repeated in the quilt and furniture. Another huge creative challenge in this room is this 5' x 12' "bump out" space. Although the bump out "existed" on the original plans, it was enclosed attic space. We had asked about having it opened up, but were told that it wasn't a possibility. Lo and behold, when we signed off on the final blueprints, it was there! Then I started panicking about what it was going to be like to essentially have a long narrow hallway in the center of the feature wall of the room. Of course it turned out to be an amazing area and mini built-in play room. I will admit that it has one too many toys in it right now and is quite crowded, but I would venture to say that the majority of Holiday's daytime play happens in this 5' x 12' space! Plus, what little girl doesn't want a window seat to crawl up on?! What I love most about this space is that it is VERY princessy without having Disney princesses on every surface. When I look back through all of the pictures in this post, I feel like I did a better job with Holiday's Big Girl room than I did with her nursery, but by decorating her nursery around items I fell in love with, I had an amazing foundation to start with in her Big Girl room. Obviously, I am NOT a professional designer-- I just love to decorate! So many times when I find myself drooling over professionally designed spaces, the items are often very unattainable for the average Joe-- or at least for the average Joe's budget! Most everything in these spaces was found at regular stores, aside from the few custom made pieces and accents. But because I'm not a professional, I hope these pictures inspire you with creativity and fresh ideas for your own spaces.